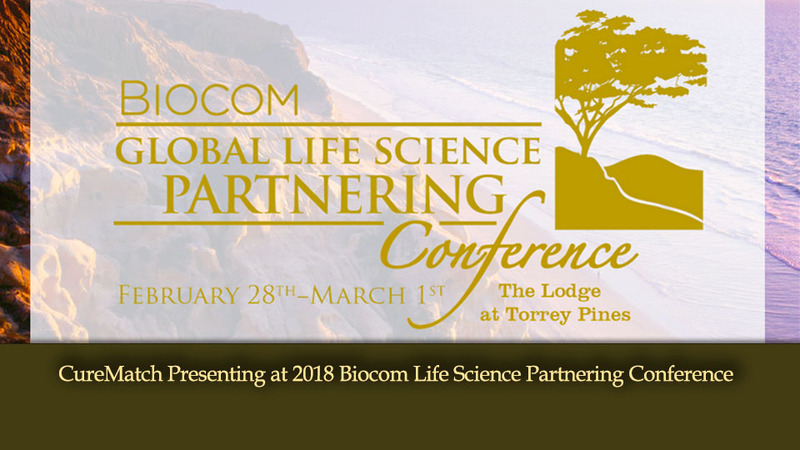 CureMatch is honored to be selected to present at the 2018 Biocom Life Science Partnering Conference. The Conference is an exclusive global partnering and networking forum that brings together senior executives, bankers, venture capitalists, and business development professionals from leading pharmaceutical and biotech companies. CureMatch has developed a proprietary software platform aimed at guiding oncologists in the selection of the most advanced personalized cancer therapies for each patient. It’s PreciGENETM report provides oncologists with a scored and ranked list of potential treatment options specific to each patient, through the integration and analysis of multiple clinical and biological features. CureMatch also partners with molecular diagnostic companies to provide added value to their analytics capabilities, and with pharmaceutical companies to provide additional insight into the potential effectiveness of their drugs, either used as single agents or in combination with other drugs. CureMatch CEO Stephane Richard, PhD, will be discussing the CureMatch platform, the PreciGENE product, recent results, and partnering options. Dr. Richard looks forward to meeting existing and potential partners and investors in the biotech and pharmaceutical industries. BIOCOM is the largest, most experienced leader and advocate for California’s life science sector. Working on behalf of more than 1,000 members to drive public policy, build an enviable network of industry leaders, create access to capital, introduce cutting-edge STEM education programs, and create robust value-driven purchasing programs.